Happy Christmas Eve everyone! I hope you are having a pleasant holiday season on this penultimate day of the 12 Days of Anime series. In this time of cheer, what better than to celebrate this wonderful phrase that everyone can get behind? 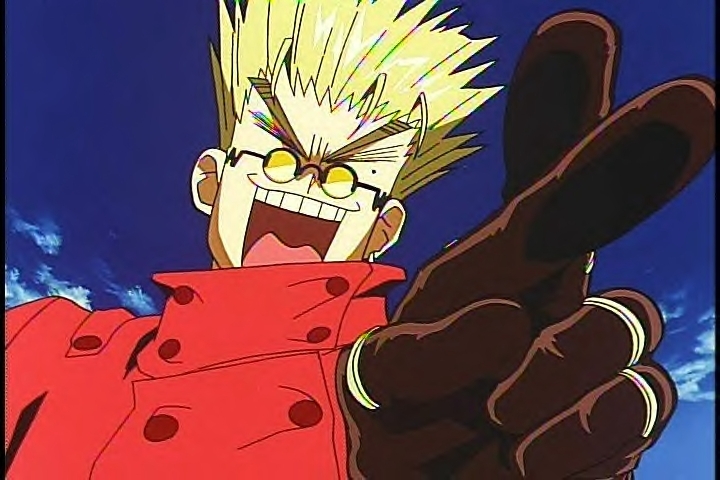 For many anime fans, the phrase “love and peace” brings to mind the catch phrase of Vash the Stampede from Trigun. But for some of us, that unreasonably upbeat gunslinger has been replaced with an equally unreasonably upbeat teenage girl and her incompetence in English. Love & Piece was one of the first gags in the first episode of the series way back in early 2007, an introduction of sorts to one of the Hidamari apartments’ tenants we would be getting to know through the seasons. It wasn’t amazingly clever or anything, but it was cute and undeniably easy to remember, in no small part thanks to Miyako’s futile effort to defend it from the upperclassmen. As we learned more and more about Miyako as we jumped back and forth in time in the coming episodes of Hidamari Sketch, it became a sort of catchphrase for her, capturing both her loving spirit and her carefree attitude. That gag was never referenced again, at least until a few weeks ago in the 9th episode of the latest iteration of the franchise. 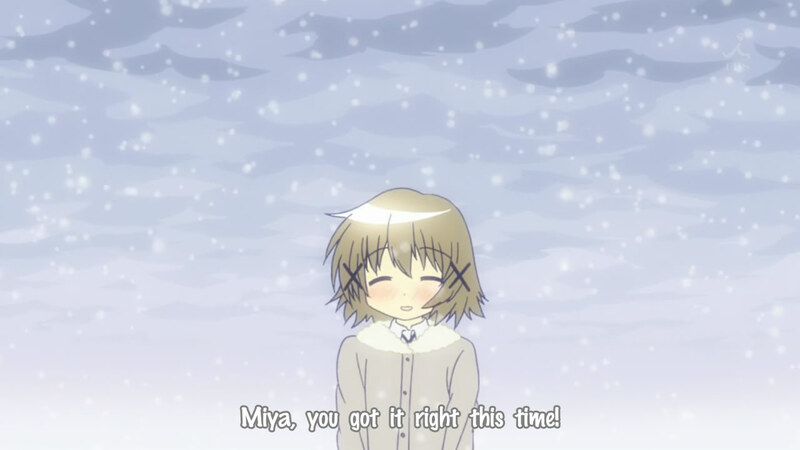 It wasn’t even real, taking place in a short dream sequence to begin the episode, lasting just long enough for Yuno to compliment Miyako for finally getting it right. Yet it was enough to make all the pleasant memories come rushing back. It was a reminder of a time when this series could only look ahead, as well as the bittersweet fact that, after this season, there would be no more Hidamari Sketch to look ahead to. It was the show’s way of saying good bye, asking us not to forget while also giving closure to one of its oldest and most memorable gags. Hidamari Sketch the anime may be behind us, but the hope and joy it provided us during its run will never be forgotten. So this holiday season, let’s fill our hearts with love, breaking them off into many pieces to spread across the world. Yeah, I think that’s how it went. Or something. I enjoyed Hidamari Sketch x Honeycomb enough to be interested in watching the previous seasons as well. I still think it’s a nice show, about halfway on a continuum between Tamayura and Yuru Yuri (both very nice shows). And even not knowing about the previous gag, it was pretty easy to figure out what Miyaki had messed up before when Yuno mentioned it. Hidamari Sketch really came out at a special time, when Shaft was hitting all the marks with their comedies, but before Bakemonogatari gave them a budget. The way they made the most of their money, using simple but effective techniques in order to make it aesthetically pleasing was quite impressive. In some ways, Honeycomb is the prettiest but also least visually inventive of the series. I guess I’m a Shaft hipster at heart. Nope, I haven’t changed my intro blurb in the time I’ve been here.